p 4; POB Mrs. Joseph J. Gilinsky. John Harmon, Other, M, S, W, 16, Sells Wood, GA/GA/GA. 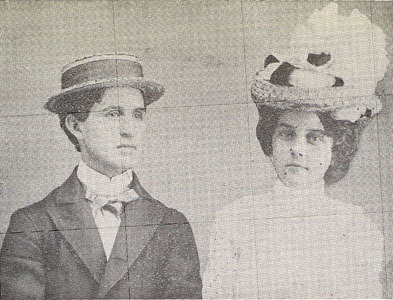 Esther Altoma Culpepper and Thomas W. Shannon, 10 May 1896, Jessamine Co., KY. Biography* � Mrs. John (Dorothy Culpepper) Wingfield preserved a 25 page typed manuscript "ONE FAMILY - CULPEPPER" written by her grandfather, Rev. George Bright Culpepper, who noted: In November of 1877, in Washington County [Rev. M. M. Culpepper's son, Rev. Charles Ross Culpepper, in a 20 Dec 1978 letter, wrote that his father was born in "Macon as I remember." According to Methodist Preachers of Georgia 1783-1900 compiled by Rev. Harold Lawrence, Rev. M. M. Culpepper's father, Rev. John B. Culpepper was assigned "1877-78 Crawford (Macon)." 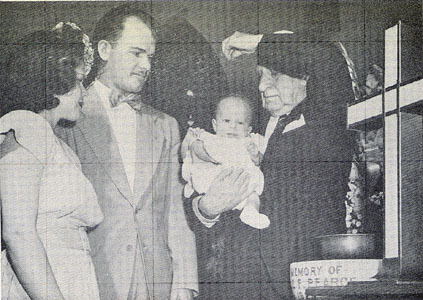 It is possible that Melvina was staying with relatives at the time of the birth], Georgia, a second child was born to John Butler and his wife, Mellie or Melvina, to whom was given the name of Marvin Myers [both son, Rev. Charles Ross Culpepper, and John Butler Culpepper family notes list the name as Marvin Myres]. This Marvin Myers Culpepper became a Methodist preacher, married Daisy Ross from Rossville, Kentucky, moved to Kansas and Arkansas, where he became a Presiding Elder in the Conference. To this couple a son and two daughters were born. I cannot give the names of the girls, but the son bears the name of Ross Culpepper, and he is a Methodist minister. Marvin Myers Culpepper died in Monroe, Louisiana, about ten years ago. He was taken back to Kentucky for burial. Charles Ross Culpepper, in a 12 Nov 1977 letter, gave his father's name as Marvin Myres Culpepper. He continued: J.B.'s children loved to go to the home of James Marion. Esther the oldest, Dad and Burke were very close. They played and had tea parties but had to have short grace. Dad was long winded, Burke drank all the grape juice and they learned. Charles Ross added that his father, "the oldest son, was a man of great ability as a man and minister. He studied law but went to the ministry." Research note* 27 Apr 2012� So, I talked to my dad about Oscar Burke D. Div. (our "prince") and his brother Marvin Myers. Dad said Marvin was a good fighter and that if it wasn't for his bad heart he would have tried to go pro. So Burke would take him around with him and Marvin would be there if they got into trouble. He didn't elaborate but it sounds like the two were as willing to throw a punch as they were sing a hymn. Rev. Marvin Culpepper of Kansas visited his grandmother here. Oscar Burke Culpepper D. Div. Marriage* 15 May 1900� He married Katherine Reginold at Memphis, Shelby Co., Tennessee, on 15 May 1900 at age 20. By Rev. Charles Smith, Jr.
A biographer always has two problems that are the Sine qua non of his success. They must adequately interpret their subject to the reader and they must synthesize the details of their subject's life so that they present a memorable pattern. It is difficult to compress Mr. Culpepper's experience into a fine tune pattern when he came to the River Valley, but it can be certain he came with the right motives in mind. It was noon on June 13, 1916, when the short and stocky Burke, along with his family, arrived in Van Buren to conduct a series of meetings in a large tent on Broadway and 8th streets. When Burke came to Van Buren he was 36 years old and had been preaching for 27 years. He began preaching at the young age of eight under the watchful eye of his father, Rev. John B. Culpepper. John was also a Methodist preacher and was very well known in his circuit in Georgia. John also worked occasionally with the Methodist evangelist, Rev. Samuel (Sam) Porter Jones. Burke had a deep admiration for Mr. Jones and his father and enjoyed the times he had spent going along with his father to hear the two preachers preach. It is evident that Burke's father made a deep impression upon his young son and began taking him on his circuits to sing the hymns and to preach. It was in these earlier times that it was the intent of most preachers to pass their "mantle" onto their children. This was certainly the case with other contemporaries of Burke's day, Mordecai Ham, Sam P. Jones, and "Gipsy" Rodney Smith. Eventually Burke was licensed to preach at the age of 19, in 1899, by the Methodist Episcopal Church, South. It was after the death of Rev. 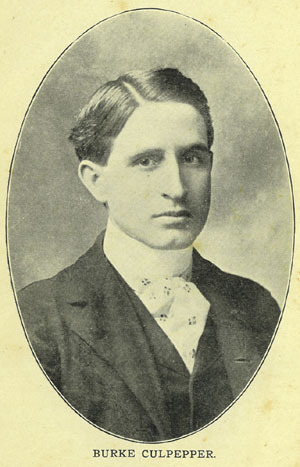 Sam P. Jones in 1906 that many newspaper journalists began to call Burke the "Sam Jones of today" after 1912 he was termed the "Billy Sunday of the South". Assailing sin and worldly wealth with volley upon volley of vituperation, Burke Culpepper, would race up and down the platform and even into the aisles of the churches he visited, while he exhorted, fighting sin to the point of "rattling the very teeth of the devil himself." As like other evangelists of his day, he had his own song leader which was John U Robinson. Burke came to Van Buren after he had successfully held several revivals in Conway, Arkansas (Jan-Feb. 1916), Jonesboro and other cities. Unlike preaching in the new sanctuary of the First Methodist Church in Conway, Burke came to the large revival tent that was pitched on Broadway and Eighth Street. On the first night of the services the local newspaper, the Van Buren Press-Argus made mention that, "His (Burke) text for the evening hour was from the Scripture, " I am the Vine and you are the branches," for about thirty minutes Rev. Culpepper drew lessons for his hearers as rapidly as the noted cartoonists on the movie screen. He is true to Christianity in action as across the length of the platform he paces and at times runs, firing truths at the congregation like a rapid fire coast defense gun, mingling the slang of today with flights of real eloquence." It also made mention that he plows with a deep plow and is said to have brought his plow with him to Van Buren. "He at all times holds the complete attention of the audience." He was able to do this because he refused to use notes or manuscripts of any type and yet he had a repertoire of over 1,000 sermons. It was noted on the third night that Burke announced that he was "to skin a tom cat on the platform" and this he metaphorically did. "In his earnestness, he left the platform and walked up and down the aisles, thundering truths at the listeners." It was notated that he would shout, "Hear me, sin will get your tag, brother, no matter who you are, no matter what position you occupy, sin will get your tag. Kill your big dog sin and you have conquered all the little vices of hell that bark at your heels." It was by the fourth service that the headlines read, "Deep Interest Being Manifested", one journalist made mention that "the attendance from Fort Smith increases each night and many remained in their automobiles during the service." As the attendance increased every evening, it was the same at the afternoon meetings, as well. Every afternoon for one hour (3-4 PM) Burke would speak a special message at different areas of Van Buren to draw more people to the evening service. By June 19th the crowds were reaching between 1500 and 2,000. The next day, the 20th, Burke was to address the business men, but was moved to the 21st to "give every business man in the city an opportunity to attend this meeting." And "that much good will result and promises to be a greater interest shown in those things that make for a better city, a cleaner city, and for a happier community." The newspaper even listed the names of the men and their businesses that would close for the Culpepper meetings from 3 to 4 PM. Following this, the sermon topic that night was the funeral sermon of Hatchett and Hammer, which was one of Burke's most powerful messages on civic righteousness and was preached especially to the Chamber of Commerce and the business men of the River Valley. It was on the 23rd that Burke offered his first call to converts, preaching primarily to the railroad men and their families. He preached on the subject of "The Cannonball to Heaven and the Cannonball to Hell". As he gave the invitation, between 25 and 30 responded. When June the 26th rolled around the headlines stated, "Culpepper Meeting Continues with Interest". It made mention that "Fort Smith, Ozark, and other nearby towns and the surrounding country sent delegations to the night service. The streets about the tabernacle were crowded with vehicles, and every available seat, in and near the tent was occupied, with many standing." It was also on this day that 42 went forward for prayer when the call was given. On the 27th more large numbers went forward for prayer and by the 28th there were 50 conversions. The headlines from the Thursday night edition of the Van Buren Press-Argus stated, "Closing Most Successful Revival Here", and under Burke's picture it made mention that, "Rev. Burke Culpepper will close a remarkable 18 days revival at the tabernacle, corner of 8th and Broadway tonight and will leave at once for Helena, where he will begin a revival next Sunday. Rev. Culpepper has probably addressed a larger number of people each day he has been in the city than any evangelist that ever held a meeting here. Interest has never waned, but increased from day to day and many conversions have resulted. The Evangelist has had the cooperation of our business men, all of whom have closed their stores for an hour each afternoon in order that their employees might attend. The discourses of the evangelist touched every phase of life. He devoted much time to municipal shortcomings in Van Buren. He told some very unpleasant truths and pointed out many faults existing here that were having a retarding effect upon the physical growth and development of the city and were dwarfing the spiritual growth of our citizens and his visit here will no doubt result in much good. During the revival Rev. Culpepper was very materially assisted by Mr. John U. Robinson, choir director, by the organization of a strong choir immediately upon his arrival here, together with his many solos, made the song service each day a most helpful and inspiring aid to the evangelist. It is understood that Rev. Culpepper and Mr. Robinson expects to visit Fort Smith next season." Biography* � Mrs. John (Dorothy Culpepper) Wingfield preserved a 25 page typed manuscript "ONE FAMILY - CULPEPPER" written by her grandfather, Rev. George Bright Culpepper, who noted: In the year 1879, in Fort Valley, Georgia, a third child was born to John Butler Culpepper and his wife, Melvina, who was given the name of Oscar Burke. He became a Methodist preacher, and at the present time (September 26, 1942) is one of the general evangelists of the Methodist Church, and lives in Memphis, Tennessee. His wife is Catherine Reginol Culpepper. They have several children and one of their sons is an eye, ear,nose and throat specialist in Birmingham, I think he bears the name of Oscar Burke, Jr. Another son, James, is a preacher. Charles Ross Culpepper wrote, 12 Nov 1977, that "Burke Culpepper was a brilliant evangelist. 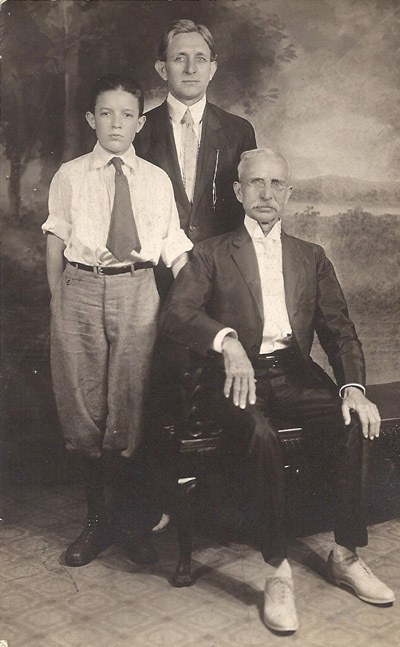 I was with him two years.... As a pastor I had Uncle Burke with me on five occasions and since Dad [Marvin M. Culpepper] died in 1927, he [Oscar Burke Culpepper, Sr.] was like a second father." Mrs. Robert Joseph Culpepper wrote in a June 1977 letter that Rev. Burke Culpepper had written a book Put God First in which he mentioned his father John B. Culpepper, D.D. and his mother, Melvina. A booklet Getting Acquainted With Father was found among personal papers of Ida W. and Edgar C. Culpepper of Lone Oak, GA and was preserved by a niece, Eleanor Culpepper Willingham. The booklet had the following dedication: Sacredly dedicated to the honor of ONE LIVING BURKE CULPEPPER, whose service to Corsicana has been of inestimable value to the religious live of her citizenship, this story from his convert, W. O. Saunders, of Elizabeth City, North Carolina, is reproduced in pamphlet form from the February, 1923, issue of the American Magazine. The following is from the INTRODUCTION of the same booklet: WITH the hope that every man or woman, boy or girl who reads this story will be more thoughtful concerning his or her father, more attentive to his happiness, and more appreciative of him, more than twenty Corsicana people have joined Hastings Harrison, General Secretary, and W. S. Goode, Boys Work Secretary, of the Y. M. C. A. in defraying the expense of printing this pamphlet. This story is taken from the February, 1923, issue of the American Magazine, and is given you in pamphlet form free of charge. W. O. Saunders is editor and publisher of the Independent Newspaper of Elizabeth City, North Carolina. The Independent has the largest circulation of any newspaper in the United States in proportion to population. In the June, 1922, issue of the American Magazine is Mr. Saunder's life's history, written by himself, entitled "The Autobiography of a Crank." As a writer he called a spade a spade, and stood out for what he believed was right, regardless of public opinion. His relationship to the people of his community was unpleasant. He was the victim of many fistic encounters, threats of violence, and was way laid many times. His trouble led finally to a gun battle between himself and some irate Church people, whom he had written about in an issue of the Independent. The most of the community turned against him, and he was recognized as an infidel. The following taken from his autobiography in the 1922 June issue of the American gives an account of his conversion, and because of its local interest is herein reproduced: "Half of the reading citizens of the town didn't speak to me. I was a social outcast. 'The Independent' was taboo in many of the so-called respectable homes. I could get almost no local advertising. "Then came to town one Burke Culpepper, an evangelist of Memphis, Tenn. A tent was pitched for him, and he began a series of union revival services, backed by all the churches. I stayed away from his meetings until it was necessary for me to attend at least one service to write about it intelligently. The evangelist captured me. He was different from the common run. The fellow was pleading with the church people to take Christ into their lives. He said a man who professed to be a Christian and who wasn't on speaking terms with every man in his town ought to get right with God or get out of the church. That sounded like honest-to-God religion to me. I went to hear Burke Culpepper again. "My second appearance at the tent was the signal for a determined and united effort upon the part of the active brethren and sisters to save my soul. It was an embarrassing situation to me, and I might have quit the meeting but for an invitation from the evangelist for anyone to testify as to any benefit derived from the meetings. I came to my feet. I told the evangelist and his audience of possibly two thousand that I was delighted with the message he had brought to the people, that nowhere in any of my writings against preachers and churchianity [sic] would they find one word in conflict with the gospel of Jesus of Nazareth. I told them that if there was any great divergence in our views it was that I believed the teachings of Jesus were practicable, and the church didn't. I was sure the church did not believe in the practical application of the teachings of the Master; because, while stressing its creeds and dogmas, it had utterly refrained from frankly facing the economic obstacles to a literal acceptance of Christ's teachings. "There was an embarrassing silence following my qualified confession of faith and expression of doubt. And then the evangelist stepped to the very front of his platform, and leaning far out, told the congregation not to worry about the salvation of W. O. Saunders. 'I behold in him a man who is seeking God for himself, a man capable of thinking for himself. He will find God.' "That evangelist from Memphis, Tenn., knew how to handle a crank. "Before he finished his campaign in Elizabeth City he had persuaded the church people themselves to bury their differences. He went into the very courthouse, where court was in session. Two lawyers in that court had been implacable enemies for years, and one had carried murder in his heart for the other. Before Burke Culpepper got through with them they had their arms around each other's neck, and everybody in the court room was shaking hands with everybody else. "Suddenly I discovered that I, the crank, the monster, the assassin of character, had become popular. People who had never spoken to me before remembered that I had done a lot of good for the town! There was less graft than in former years. The streets were paved. Then sanitary condition of the town had improved. The town had forged ahead in every way. A year later, I was unanimously elected to represent the county in the General Assembly. "I am often told that The Independent is the best looking, best edited country newspaper in America. The Independent has succeeded only as it served its people. I have worked almost sixteen hours a day for almost thirteen years, putting my best and my worst into this country newspaper. I have given much punishment, and in turn, have been punished much for my crankiness. Out of it all I have learned a few lessons that may be epigrammatically stated: "I have learned that the American people have a lively passion for the truth, the whole truth, and nothing but the truth, about everything and everybody--except themselves and their family connections. "I have learned that the people prefer entertainment to reformation. Even the medicine faker could not have sold his wares without his bag of tricks. "I have learned that there are few heads for facts and figures, but that everybody has a heart. "I have learned that I am not at all like other men, and that other men are not at all unlike me; all of us have our ideas, our ideals, our whims, our idiosyncrasies--call them what you will-- and that a graveyard no larger than a county will eventually hold us all." The following is from the same booklet: Governor Neff Commends Rev. Burke Culpepper Hon. Pat M. Neff, Governor of Texas, on January 29, wrote Rev. Burke Culpepper as follows: "Just before I left Waco, my home town, to come to Austin to assume the duties of Governor you held a series of meetings there, covering several weeks. The atmosphere created by you in those meetings helped me to solve several questions pertaining to my duties as Governor. "You have been preaching for three weeks in Austin at the beginning of my second administration. Your sermons have been helpful in fostering and promoting among our citizenship an appreciation of the worth-while things of life. As you leave this morning for other fields of labor, I want you to know that you carry with you my personal commendation of the work that you are doing and my sincere appreciation of the friendship that has grown up between us for the past few years. I just want you to know as you go that your services have been helpful here in the Capitol of the State, and that I am for the gospel you preach." Kattie B. Culpepper, Wife, F, Mar-1882, 18, md-0 yrs, Ch 0/0, TN TN TN. John Butler Culpepper, Happy Home, Louisville, Kentucky: Pickett Publishing Company, 1905. A Victorious Battle in Van Buren, or 18 Days of Rattling the Teeth of the Devil: A Brief Synopsis of the Dr. Oscar Burke Culpepper Revival in Van Buren, Arkansas, June 13-30th, 1916, article written by Rev. Charles Smith Jr., 2211 Quarry Drive, Van Buren, Arkansas 72956, e-mail address and submitted to Warren Culpepper, 16 Aug 2010. James Marion Culpepper, Burke Culpepper Prince of Evangelists, Louisville, KY: The Herald Press, 1952.
opposite Title Page, courtesy of Richard C. Kearney, Ph. D.
Caption on page: Dr. Burke Culpepper. Page 69, courtesy of Richard C. Kearney, Ph. D.
Caption on page is "Fighter of Sin." Page 129, courtesy of Richard C. Kearney, Ph. D.
Marriage* 15 May 1900� She married Oscar Burke Culpepper D. Div. at Memphis, Shelby Co., Tennessee, on 15 May 1900. Blanche Culpepper Parks, Dade Co., FL, Female, White, Vol 1631, Cert 333, died 1954. E-mail written 14 May 2005 to Warren L. Culpepper from Dee Park Mitchell, e-mail address. Biography* � Mrs. John (Dorothy Culpepper) Wingfield preserved a 25 page typed manuscript "ONE FAMILY - CULPEPPER" written by her grandfather, Rev. George Bright Culpepper, who noted: In 1887 another daughter came to this couple who was given the name, Mattie Key. She married a man named Goldsberry Mackey, and with her husband she is living [5 Oct 1942] down beyond Tampa, Florida. They had two children, a son and daughter; the son bears the name Goldsberry; I think the daughter is dead. Willard Culpepper (Mrs.) and Thomas R. Stevens on 5 Sep 1914 in Lowndes Co., GA, Book G-376. Rev. John Butler Culpepper Jr. Biography* � Mrs. John (Dorothy Culpepper) Wingfield preserved a 25 page typed manuscript "ONE FAMILY - CULPEPPER" written by her grandfather, Rev. 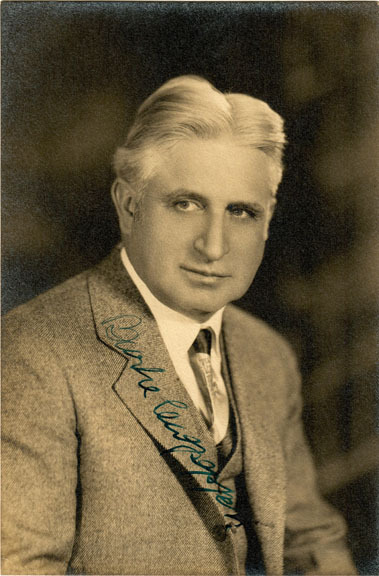 George Bright Culpepper, who noted: In the year 1896, in Lebanon, Missouri, another son was born, to whom was given the name, John Butler, Jr., after his father. He is a Methodist preacher in Florida, stationed at Fort Pierce at this time (September 26, 1942). He and his wife have one child, a daughter. Charles Ross Culpepper wrote, 2 Dec 1978, of John Butler Culpepper, Jr.: This was the third son of J.B. Senior to travel with and learn preaching from a master.... John B. had a very keen mind and could remember a sermon after reading it through twice. Like my father and many others a bad heart took him away in his prime. The following is obituary is from a Fort Myers, FL, newspaper, December 31, 1947: The Rev. John B. Culpepper, Jr., pastor of the First Methodist Church, died at the Lee Memorial Hospital at noon yesterday after a brief illness resulting from a heart ailment. He had held the Methodist pastorate here for three and a half years, coming to Ft. Myers from Ft. Pierce in June 1944. He succeeded the Rev. W. A. Myers. Survivors include his widow, Martha Ann; a daughter, Martha Key; two sisters, Mrs. J. G. Mackey of Lakeland and Mrs. W. S. Park of Atlanta; one brother, Burke Culpepper of Memphis, Tenn; and a nephew, Ross Culpepper of Vienna, W. Va. Funeral services will be held at noon Friday in the First Methodist Church. Arrangements are in charge of Lawrence A. Powell. Rev. Culpepper had been granted a leave of absence from the pulpit a few weeks ago. Dr. George H. Pearce of Detroit has been substituting since that time and it is expected he will continue in this capacity until a temporary appointment is made by Bishop(?) 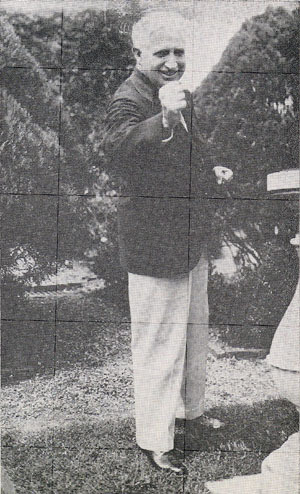 Arthur I. Moore in Atlanta. Yearly appointments to the Methodist Pastorates come in June. The Methodist minister was born June 20, 1896 in Wilmore, KY, the son of Evangelist and Mrs. John B. Culpepper. He began early religious training under the guidance of his father and continued formal study at Emory University Theological Seminary. Rev. Culpepper's first pastorate was at Bunnell, FL. He later served First Methodist Churches at Jacksonville, Key West, Okeechobee, Tampa, and Fort Pierce. At the time of his death, Rev. Culpepper was president of the Ft. Myers Ministerial Association. During his three and one half year tour of duty here he had been associated with many religious projects. ED67 sht2 ln12 (John B Jun 1896 KY in hh of John B. Culpepper. Annie Culpepper, Wife, F, W, 21, M, FL/SC, SC. Martha Anne Culpepper, Cert 54270, Saint Johns Co., FL, White, 10 Jan 1897 - 24 Jul 1976. Walter B. Culpepper, Son, M, Sng, Wh, 2, GA/GA/GA. Biography* � Mrs. John (Dorothy Culpepper) Wingfield preserved a 25 page typed manuscript "ONE FAMILY - CULPEPPER" written by her grandfather, Rev. George Bright Culpepper, who noted: Up in Chattooga County, Georgia, not far from Summerville, a second child was born to LaFayette Culpepper and his wife, Jennie, a son weighing a little less than 3 pounds at birth. He grew to manhood and married Nevada Baxter of Pierce County, Georgia, near Blackshear. To them were born two sons; the oldest was drowned while in bathing. He was about twelve years old. The other attained his majority, moved to California with his parents but a few years later returned to Georgia and at last accounts was living at Waycross. This second son of LaFayette Culpepper bore the name of Walter Brooks Culpepper; and he and his wife are still living in California, near or in Pasadena. Walter B. Culpepper, Head, M, Jun 1877 (22), S, GA/GA/GA, Farm Laborer.